SB DNA Agarose resolves small DNA/RNA nucleic acid fragments having less than <1200 BP in length. This gives this Agarose qualities which improve separation to levels normally associated with Acrylamide PAGE. For instance, increasing the concentration of the Gel increases the separating resolution, giving finer separation at higher percentages e.g. 3% w/v Gel 150-800BP, 4% w/v Gel 20-500BP, 5%w/v Gel 10-300BP. This is similar for different buffer systems using 1X TBE or 1X TAE. 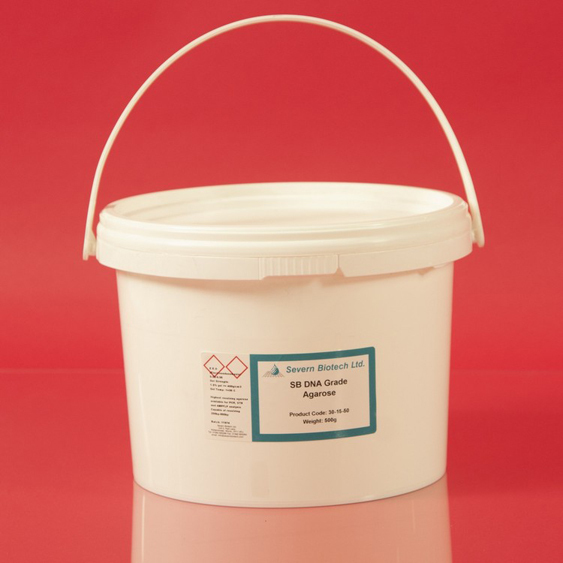 SB DNA Grade Agarose is recommended for analytical gels of DNA lower than 1,200 bp and especially for PCR product. This should be the Agarose of choice for fine nucleic acid separations used in Molecular Biology work. EEO= 0.02-0.05, Sulphate content <0.25% , Gel Strength >400g/cm, Gelling Temp. >36C.